Today is inauguration if anyone has missed it. Being here in DC this weekend is really amazing! It is not often politics is causing such excitement. Washington has been packed with people these past days but everyone is in a good mood and there are small celebrations in every corner. Sunday was the big concert and I and my colleague Anna headed down to the Mall. Unfortunately we got there too late and despite standing in line for over an hour, we did not get in to the actual concert area (the Mall is a big park and we weren’t aware that they would actually close it down and restrict entrances). 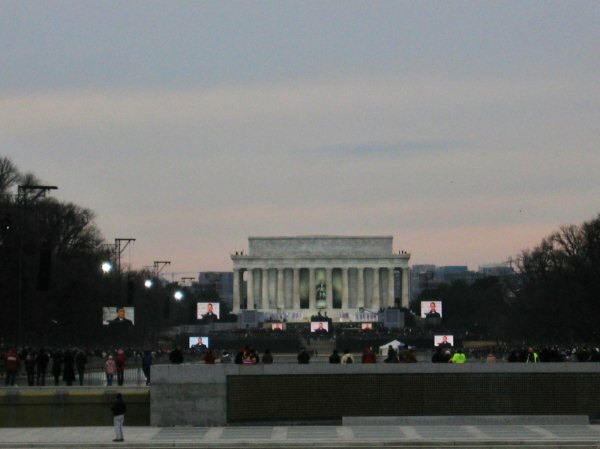 Instead we saw the concert from the other side of the Reflecting Pool and the WWII Memorial. Actually, with my bad eyes I did not see very much at all of course, but at least I could hear Obama speak and U2, Bruce Springsteen, and the other artists perform. And be out in there in the middle of the crowd. It was an amazing feeling to see the masses of Americans out there, listening to them joining him in his call for change! And despite immensely badly organized logistics (in addition to badly arranged sounds and visuals, there could have been a real disaster if they would have had to evacuate the place due to some kind of emergency), everyone was calm and happy. When Obama spoke, there was a complete silence among the millions of people that had gathered. Truly amazing! Now I am heading down to the Parade. Don’t really expect to see anything though but will be fun just to be there.